Rod and Annie Haig, Glanalan, Catherine Street. 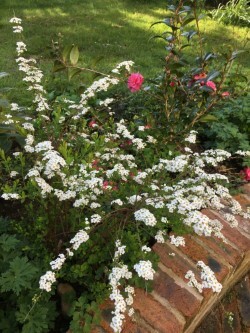 We bought our newhome in 2014 with a well stocked and established garden with wonderful seasonal colour. However 2 years of building works took their toll but luckily most plants were very resilient. Our last garden was a courtyard so I was used to container gardening and alkaline soil. The acid-loving plants seem to thrive here which is great fun having a total change. 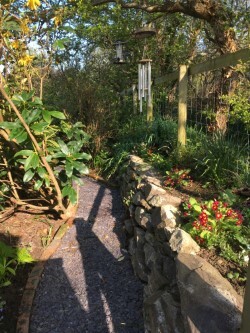 New front garden bed – spring colour at the moment and have put in summer bedding. Other side of wall is a bridleway. 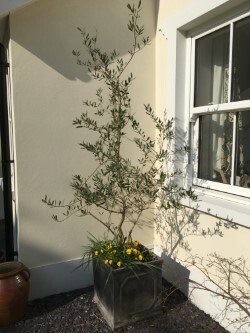 Olive tree has survived the harsh winter! 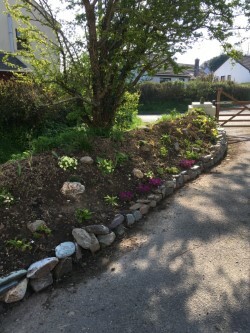 New front border – I love overcrowding but not sure where I’m going to put the dahlias which are waiting to get their feet in the ground …. 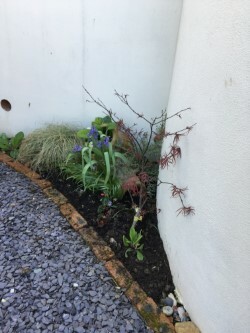 Damp corner using an old chimera – I’ve grown some new plants including ammi major, cleome and cerinthe for dotting around and see if they like it here. 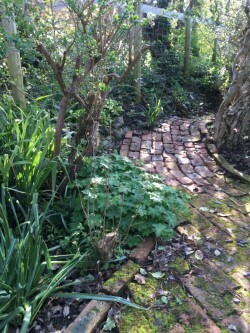 New paths for grandchildren to explore. Please note that this garden is suitable for dogs on leads only. The garden is also very tricky for pushchairs or wheelchairs.